RUSSELL, ELIZABETH, gentlewoman and diarist; b. 26 Dec. 1754 in Gibraltar, only surviving child of Richard Russell and his second wife, Dorothy Harrison; d. unmarried 19 Feb. 1822 in York (Toronto), Upper Canada. When Elizabeth Russell was born, her Irish father was a captain in the 14th Foot; nine months later he was cashiered because of an unsavoury imbroglio involving a woman and a fellow officer. Disgraced, friendless, knowing only army life, Richard Russell was eventually appointed naval officer at Harwich, England. Mrs Russell’s mental stability was shaken by her husband’s misfortunes; for a number of years prior to her death in 1779 she was violently insane, and was cared for by her daughter. Elizabeth grew up with little education, in an atmosphere darkened by her mother’s insanity and her father’s debts, extravagance, ill health, and lawsuits. After his court martial, Richard Russell had quarrelled with many people, including his only legitimate son, Peter*, Elizabeth’s half-brother. It was not until 1771 that Peter visited Harwich. Elizabeth was charmed with her unknown, unmarried brother, who was more than 20 years older than she was, while Peter was delighted to help with advice, instruction, and encouragement. He returned from the American colonies in 1782, and after their father’s death in 1786 he and Elizabeth lived together in Ipswich; they were to be a devoted couple for the rest of their lives. In 1791 Peter Russell was appointed receiver general of Upper Canada, and on 1 April 1792 the Russells left England with Chief Justice William Osgoode and Attorney General John White*, who remained their closest friends in their early years in Upper Canada. With them also was Mary Fleming, whom Peter had brought back from America and placed in Elizabeth’s charge. Born in 1779 at Peter’s house in New York, she was probably his illegitimate daughter. 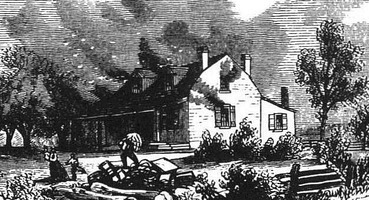 The Russells settled in the temporary capital, Newark (Niagara-on-the-Lake), where Mary died of tuberculosis on 20 Jan. 1797. Elizabeth was very ill after Mary’s death, and was still grieving when she moved to the new capital, York, on 3 November. From 1796 until 1799, when Peter was administrator of the province, the Russells entertained officially, but both obviously preferred a quiet life, particularly when Peter’s health deteriorated several years before his death in 1808. Their closest friends in this period were the family of their first cousin, William Willcocks*, especially his son-in-law, William Warren Baldwin*. A more distant cousin, Joseph Willcocks*, lived with them from 1800 to 1802, but because he tried to court Elizabeth he was cast forth from the house and from favour. After Peter’s death, Elizabeth, in poor health, faced settling his official accounts and managing the Russell estate. Baldwin helped with the business and an operation for dropsy in 1811 brought physical relief, but her spirits never recovered from Peter’s death. During the War of 1812 her dejection became mental illness. In December 1814 the Baldwin family moved into her house, where she died in 1822. Peter had left Elizabeth his entire estate, including thousands of acres of land; by her will she left almost all this property to William Willcocks’s two surviving daughters, Margaret Phœbe (wife of William Warren Baldwin) and Maria, who died unmarried. The vast Russell estate thus passed eventually to the Baldwin family. Elizabeth Russell was unlike most of the other upper class women of her day in Upper Canada because she was older, not as well educated, and unmarried. Although she was always desperately homesick for England, she would never leave her brother, and indignantly rejected several proposals of marriage in York. She could be remarkably silly, but she could also be surprisingly shrewd. In her letters and diary she has left a detailed picture of one woman’s life in early Upper Canada. AO, ms 75; ms 88. MTL, W. W. Baldwin papers; Elizabeth Russell papers; Peter Russell papers. PAC, MG 23, HI, 5; HII, 7 (photocopies); MG 24, C1 . Univ. of Guelph Library, Arch. Coll. (Guelph, Ont. ), J. MacI. Duff coll., Samuel Peters papers. Town of York, 1793–1815 (Firth). A. S. Thompson, Spadina: a story of old Toronto (Toronto, 1975). Edith G. Firth, “RUSSELL, ELIZABETH,” in Dictionary of Canadian Biography, vol. 6, University of Toronto/Université Laval, 2003–, accessed April 24, 2019, http://www.biographi.ca/en/bio/russell_elizabeth_6E.html.